On June 25, 2018, the IoSense project partners Dominik Grzelak and Thang Duy Phan from TU Dresden visited the first meeting of the new Silicon Saxony e. V. working group “Smart Systems & Internet of Things” at T-Systems Multimedia Solutions GmbH in Dresden. The first meeting of the new Silicon Saxony e. V. working group “Smart Systems & Internet of Things” at T-Systems Multimedia Solutions GmbH in Dresden took place on June 25, 2018. 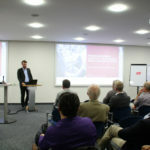 About 60 participants accepted the invitation to learn about the direction of the working group resulting from the merge of the former Working Groups called “Cyber-physical Systems, Smart Integrated Systems” and the “Internet of Things” group. The new working group wants to grow into a recognized information and communication platform in this area. Oliver Jeutner from AIS Automation Dresden GmbH gave insights into his experiences with the intelligent management of equipment life cycles. 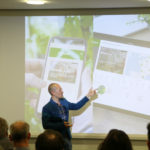 Prof. Dr. Yves-Simon Gloy of the Saxon Textile Research Institute e. V. (STFI) showed how the competence network futureTEX promotes the digitization of the textile industry. Toni Trommer from myfood familiarized the audience with the innovative idea of ​​a networked greenhouse for digitizing urban agriculture. Both researchers, Dominik Grzelak and Thang Duy Phan, working on a robust, efficient and reliable software-solution for the integration of sensors in IoT application in the network edge. 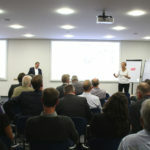 They used the opportunity to socialize with new contacts, and allowing them to get the insight of the current digitalization initiatives in Saxony.